MAKE no mistake, Namibia is vast. Crossing the frontier at Ariamsvlei, just past Upington, it is sobering to think that this border stretches northwards from here for 1000km in a dead straight line and that this line still only covers about half the distance to Angola. With an average population of only 2.5 people per square kilometre (compared with South Africa’s 39), Namibia has a lower population density than all but one country in the world: Mongolia. It shows. You can drive for hours on end without seeing a soul – but there’s so much more to Namibia than its souls. This seemingly empty country opens the traveller’s eyes like no other – the epitome of good travelling and astonishing broad landscapes. Occasional cheerful, tight-knit communities brim with multi-cultural people living harmoniously under a huge, clear blue sky. The roads are excellent and, what’s more, the Namibians are great outdoorsmen. Their country, therefore, offers superb facilities for campers. The last few wearing kilometres of our journey are mitigated by the cheerful waves of the grader-operators. Unimaginably long views over yellow grass are backed with lines of black craggy mountains in the east, and in these mountains lies the world’s second-largest canyon. Winding down the ever-narrowing gullies, we arrive just before dark in Ai-Ais camp, at the southern end of the Fish River Canyon. The resort has been destroyed by the river three times since 1970, but was recently rebuilt with conclusive flood defences. The resulting new complex is seriously swish. Ai-Ais, aptly, means “scalding water”. After our evening cycle up the hill, watching the klipspringers and avoiding an irritable ostrich, the bathwater-temperature swimming pool has no cooling effect whatsoever and the mineral springs are almost too hot for a dunk. The canyon’s main viewpoint, near Hobas in the north, is a truly gasp-inducing sight and the hike along the rim renders us worthy of a good home-grown lunch at the nearby Cañon Roadhouse, where we shelter from the midday sun. The garden is inexplicably littered with rusting, wheel-less skedonks – a warning, maybe, of the risks of driving into the desert unprepared. Weaving down to the Orange River the next day, our route to Lüderitz takes us deeper into the Ai-Ais Richtersveld Transfrontier Park. It is an unmarked but typically well-maintained piste around the bottom of the canyon, crossing the Fish on a causeway and meandering across dusty plains and along kloofs of tortured mountains, towering black and burnt orange above the road. Raptors soar hungrily along the ridges. The diminutive port of Lüderitz, more German than Germany, boasts impressive lines of architectural continuity in Bavarian style. The nearby Diaz lighthouse, the flamingo pans, the wild horses and the extraordinary ghost town of Kolmanskop all make the long detour worthwhile. We arrive in the town to find that our accommodation at the Namibian Wildlife Resorts (NWR) Shark Island hasn’t been cleaned and, by the look of it, isn’t going to be entirely habitable once it has. After some negotiation, we relocate to a (marginally) more modern unit, perched on the rocks, overlooking the entrance to the harbour and buffeted by the gale, then set out to investigate the town’s fledgling waterfront for oysters, oysters and more oysters. A few days later, oystered out and going northwards, we make a handy one-night stay-over between Aus and the (disappointing) Duwisib Castle. Helmeringhausen is a tiny farm settlement with petrol station, shop, museum, hotel and a very fine gemsbok steak. Bear in mind that cycling and camelthorns are incompatible – we pick up 10 punctures per wheel from a short spin down the main road towards Mariental. Everybody, understandably, wants to go to Sossusvlei, our next destination. Once a remote and unheard-of field of dunes, it came to the tourist world’s attention on television, spattered with windsurfers, on one of the rare occasions that the Tsauchab River has pushed through and filled up the pan. Its popularity is, of course, its downfall. Lines of buses and backpackers queue at the gates before dawn to see the sun rise over the dunes. Avoiding the crowds, we go in at 9am, past Dune 45, where the great ant-like backpacker columns climb over the pyramid of orange sand, and push on, instead, to Dead Vlei. Here, although never quite alone, one can still immerse oneself in the isolation of the spacious white clay pan, dotted with the dead acacias, the red dunes towering 300m overhead. The star turn is naturally Sossusvlei itself but here, too, the crowds impose and the sociable weavers attack our picnic. We escape by climbing along the ridge of a nearby tall dune, from which we can look down on the vlei and across the hundreds of dune-tops. Only from up here, away from the screaming 4x4s, is the true grandeur of the place fully revealed. There are dozens of accommodation options near Sossusvlei and, geared to the top end of the market, some are built in the most extraordinary designs. Castles, wigwams and glamorous urban Tuscan are all here and all out of place. The most expensive option looks like the back end of an industrial laundry. The best value accommodation is Sossuvlei Desert Camp, offering a line of cunningly-designed self-catering units strung across the sand with spectacular views of Tsarisberg as it changes colour in the sunset. And it’s far enough off the road that you won’t hear the early morning convoy or be caked in its dust. Further north, en route through the Naukluft Mountains, lies the tiny hamlet of Solitaire. It is little more than a trading store and coffee shop, but offers one of the best slices of Apfelkuchen this side of the Danube. A few kilometres further on, Solitaire Guest Farm provides rooms, biting meerkats and campsites under thatched lapas, although even those can’t offer protection from the rare east wind, which blows up suddenly in the night and pounds us with flying gravel. The road to the coast is an ongoing assault of bright-sun sights and open scenes. Cracked rocky cliffs lead winding roads down into dry river beds followed by steep climbs to viewpoints high over the Namib. Loose lines of thorn-bush show where the underground rivers run but, these apart, the desert stretches out across hundreds of kilometres of unchanging pale yellow. And everywhere there are gemsbok, springbok, ostrich and more sociable weavers – all somehow surviving in this all-encasing heat. Twenty kilometres from Walvis Bay, approaching from the Namib-Naukluft, we are enveloped by a deep cotton-wool fog as the temperature drops from 40°C to 15°C in the space of a kilometre. These are perfect conditions for us to go German for a few days – to eat local asparagus, delicious smoked barbel and pork chops with sauerkraut at the Brauhaus, drink Swakopmund’s famous Hansa beer and go mad on pastries. And more oysters. Swakopmund is so German you almost feel as if the cars are on the wrong side of the road and that you’ll be locked up for jay-walking but, after more than a week in the desert, it’s good to be cold, to swot up in the museums, to marvel at the Kristal Gallerie and to walk around the shops and stock up on leather. For a few days only. Then the open spaces of the Namib, the searing heat, the magnificent mountain passes, the oryx and those friendly sociable weavers call again. Ai-Ais Camp, Fish River Canyon: Has hotel rooms from R500 pp B&B and a campsite for R100 pp. Shark Island in Lüderitz: The camp site (R50 pp) is very windy and the self-catering (R100 pp) very scruffy. Try to get the Lighthouse (R150 pp). For both of the above, visit www.nwr.com.naor phone +264 61 285 7200 (Windhoek) or 021 422 3761 (Cape Town). Helmeringhausen: Camping, B&B, museum, horse riding, restaurant, well equipped rooms. R390 pp sharing B&B or R540 DB&B. Camping from R160 per site. Visit www.helmeringhausen.com or phone +264 63 283 307. Sossusvlei Desert Lodge, Sesriem: High quality self-catering. From R990 for two people sharing. No camping. NWR runs the only Sesriem campsite, contact details above. 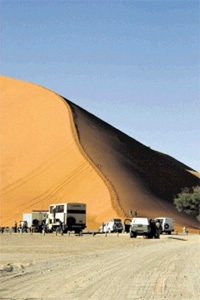 Visitwww.desertcamp.com or phone +264 63 683 205. Solitaire Guest Farm, Solitaire: Camping, self-catering, B&B, game drives and hiking trails. From R520 pp B&B. Camping R90pp. Visit www.solitaireguestfarm.com or phone +264 62 682 033. Alte Brücke Campsite, Swakopmund: Chalets (face-brick but comfortable) from R380 pp sharing, B&B. Bigger chalets work out cheaper with more occupants. Civilised, paved and lawned camp-sites with braai, private shower and toilet from R280 per site. Visit www.altebrucke.com or phone +264 64 404 918. Remember: South Africans benefit from a special SADC or regional rate at many lodges and camps in Namibia, so always state your country of origin when booking and checking in.